Most people will live to experience ageing. Age-related deterioration is affecting an ever-growing number of people. Although the process is unavoidable, if we better understand the process, as a physiotherapist, it is important to understand that we might be able to positively influence aspects that maintain or engender better health and wellness as a person ages, treating and ameliorating symptoms of common conditions associated with ageing. In the past, maximum life span (the maximum biological limit of life in an ideal environment) was not thought to be subject to change with the process of ageing considered non-adaptive, and subject to genetic traits. In the early 1900s, a series of flawed experiments by researcher Alexis Carrel demonstrated that in an optimal environment, cells of higher organisms (chickens) were able to divide continually, leading people to believe our cells to potentially possess immortal properties. In the 1960’s Leonard Hayflick disproved this theory by identifying a maximal number of divisions a human cell could undergo in culture (known as the Hayflick limit), which set our maximal life span at around 115 years. Life span is the key to the intrinsic biological causes of ageing, as these factors ensure an individual’s survival to a certain point until biological ageing eventually causes death. There are many theories about the mechanisms of age related changes, and they are mutually exclusive, no one theory is sufficiently able to explain the process of ageing, and they often contradict one another. Modern biological theories of ageing in humans currently fall into two main categories: programmed and damage or error theories. The programmed theories imply that ageing follows a biological timetable (regulated by changes in gene expression that affect the systems responsible for maintenance, repair and defense responses), and the damage or error theories emphasise environmental assaults to living organisms that induce cumulative damage at various levels as the cause of ageing. These two categories of theory are also referred to as non-programmed ageing theories based on evolutionary concepts (where ageing is considered the result of an organism’s inability to better combat natural deteriorative processes), and programmed ageing theories (which consider ageing to ultimately be the result of a biological mechanism or programme that purposely causes or allows deterioration and death in order to obtain a direct evolutionary benefit achieved by limiting lifespan beyond a species-specific optimum lifespan (Figure 1). Figure 1: Evolutionary cost/ benefit of additional lifespan vs. age. Curve 1: Modern non-programmed aging theories – The evolutionary value of further life and reproduction is effectively zero beyond some species-specific age. Curve 2: Modern programmed aging theories – There is an evolutionary cost associated with surviving beyond a species-specific age. 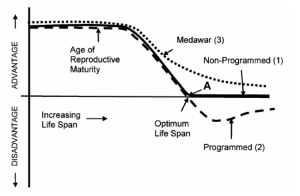 Curve 3: Medawar’s concept – The evolutionary value of survival and reproduction declines with age following a species-specific age. Goldsmith's review of modern programmed (adaptive) theories of biological ageing investigates how organisms have evolved mechanisms that purposely limit their lifespans in order to obtain an evolutionary benefit. In his review of the modern theories of ageing, Jin highlights three sub-categories of the programmed theory, and four sub-categories of the damage or error theory, and also relates some to how these might be observed in ageing populations. 1) Programmed Longevity, which considers ageing to be the result of a sequential switching on and off of certain genes, with senescence being defined as the time when age-associated deficits are manifested. 2) Endocrine Theory, where biological clocks act through hormones to control the pace of ageing. 3) Immunological Theory, which states that the immune system is programmed to decline over time, leading to an increased vulnerability to infectious disease and thus ageing and death. 1) Wear and tear theory, where vital parts in our cells and tissues wear out resulting in ageing. 3) Cross-linking theory, according to which an accumulation of cross-linked proteins damages cells and tissues, slowing down bodily processes and thus result in ageing. 4) Free radicals theory, which proposes that superoxide and other free radicals cause damage to the macromolecular components of the cell, giving rise to accumulated damage causing cells, and eventually organs, to stop functioning. Trindade et al provide a different viewpoint again, stating that to understand the evolution of ageing, we have to understand the environment-dependent balance between the advantages and disadvantages of extended lifespan in the process of spreading genes. These researchers have developed a fitness-based framework in which they categorise existing theories into four basic types: secondary (beneficial), maladaptive (neutral), assisted death (detrimental), and senemorphic aging (varying between beneficial to detrimental). Refers to an inevitable process in which many of the relationships between a person and other members of society are severed & those remaining are altered in quality. Withdrawal may be initiated by the ageing person or by society, and may be partial or total. It was observed that older people are less involved with life than they were as younger adults. As people age they experience greater distance from society & they develop new types of relationships with society. In America there is evidence that society forces withdrawal on older people whether or not they want it. Some suggest that this theory does not consider the large number of older people who do not withdraw from society. This theory is recognised as the first formal theory that attempted to explain the process of growing older. Is another theory that describes the psychosocial ageing process. Activity theory emphasises the importance of ongoing social activity. This theory suggests that a person's self-concept is related to the roles held by that person i.e. retiring may not be so harmful if the person actively maintains other roles, such as familial roles, recreational roles, volunteer & community roles. To maintain a positive sense of self the person must substitute new roles for those that are lost because of age. And studies show that the type of activity does matter, just as it does with younger people. First proposed by Professor Vladimir Dilman and Ward Dean MD, this theory elaborates on wear and tear by focusing on the neuroendocrine system. This system is a complicated network of biochemicals that govern the release of hormones which are altered by the walnut sized gland called the hypothalamus located in the brain. Because the free radical molecule has an extra electron it creates an extra negative charge. This unbalanced energy makes the free radical bind itself to another balanced molecule as it tries to steal electrons. In so doing, the balanced molecule becomes unbalanced and thus a free radical itself. The membrane theory of aging was first described by Professor Imre Zs.-Nagy of Debrechen University, Hungary. According to this theory it is the age-related changes of the cell's ability to transfer chemicals, heat and electrical processes that impair it. ↑ Hayflick L. Theories of biological aging. Experimental Gerontology. 1985; 20:145-159. Accessed 25 September 2018. ↑ 2.0 2.1 Jin K. Modern biological theories of ageing. Aging Dis. 2010; 1(2): 72–74. Accessed 25 September 2018. ↑ 3.0 3.1 Goldsmith TC. Modern evolutionary mechanics theories and resolving the programmed/non-programmed aging controversy. Biochemistry (Mosc). 2014; 79 (10): 1049 - 55. ↑ Trindade LS, Aigaki T, Peixoto AA. A novel classification system for evolutionary aging theories. Front Genet. 2013; 6 (4): 25. Accessed 25 September 2018. ↑ Achenbaum WA, Bengtson VL. Re-engaging the Disengagement Theory of Aging: on the history and assessment of theory. Development in Gerontology. Gerontologist. 1994; 34(6): 756–763. ↑ Diggs J. Activity Theory of Aging. In: Loue S.J., Sajatovic M. (eds) Encyclopedia of Aging and Public Health. Springer, Boston, 2008. ↑ 7.0 7.1 7.2 Weinert BT, Timiras PS. Invited review: theories of aging. Appl Physiol. 2003; 95: 1706–1716. Accessed 25 September. ↑ Harman, D. Aging: a theory based on free radical and radiation chemistry. J Gerontol. 1956;11 (3): 298–300. ↑ Zs.-Nagy I. The Membrane Hypothesis of Aging. Florida: CRC Press, 1994. ↑ Zs.-Nagy I, Nagy K. On the role of cross-linking of cellular proteins in aging. Mech Ageing Dev. 1980; 14 (1–2): 245-251.